On the Road to the Kentucky Derby, we are down to two prep races – this Grade 1 Arkansas Derby and the Grade 3 Stonestreet Lexington Stakes at Keeneland. Many more points are on the line in this race, with the winner earning 100 and therefore assured a starting spot in Louisville in three weeks. As such, 11 have signed on to run here including winners of both divisions of the Grade 2 Rebel Stakes run over the track one month ago – Long Range Toddy and Omaha Beach. Improbable may go to post as the betting favorite in the Arkansas Derby even though he was beaten a neck by Long Range Toddy in one of the divisions of the Rebel. If this happens, it will be because Improbable had been away from the races for more than three months before the Rebel and because he won the Grade 1 Los Alamitos Futurity prior to that. Galilean was third in the division of the Rebel won by Long Range Toddy and may improve back to the form shown winning the California Cup Derby before that. Country House proved himself at the level when second in the Grade 2 Risen Star in February before a fourth place effort in the Grade 2 Louisiana Derby so badly needs a first or second place finish to go on to Kentucky next month. Similarly, Grey Attempt won the Smarty Jones Stakes at Oaklawn in January then faded to 11th and last in the Grade 3 Southwest Stakes before winning the Gazebo Stakes, a six furlong sprint, last month. Six Shooter won the non-graded Big Drama stakes in January but ran fourth in both the Smarty Jones and Southwest then finished third behind Gray Attempt in the Gazebo. The rest of the field – Jersey Agenda, Laughing Fox, One Flew South and Tikhvin Flew, appear overmatched. Galilean will be my top choice to win this year's Arkansas Derby as I'm expecting big improvement off his third place finish last month in the first division of the Rebel Stakes won by Long Range Toddy. Galilean nearly won his first four races, all stakes, including his debut, as his only defeat in those races came by a neck in the second start of his career. Galilean closed out his 2-year-old campaign with a nine-length win when tried in a route for the first time in the King Glorious Stakes. 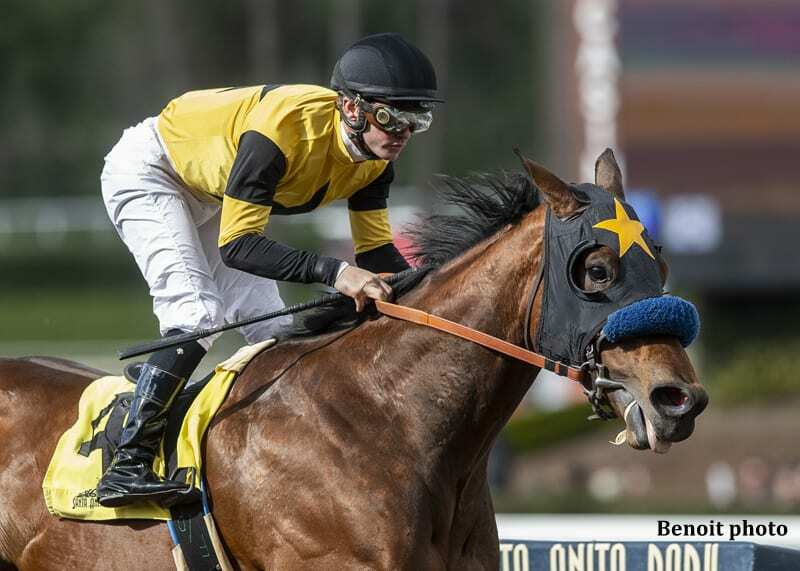 He returned off two months of rest in February and won the California Cup Derby as if he had never been away, winning by four and one-half lengths. His next start came in the Rebel, in which he stalked the pace early in third, moved up to battle neck and neck for about a half mile before settling for third behind Long Range Toddy and Improbable. Trainer Jerry Hollendorfer takes blinkers off Galilean for the Arkansas Derby and based on his last effort, that may be the ticket to big improvement off the 105 Equibase Speed Figure earned in the Rebel. The removal of blinkers will help the colt to see on all sides as well as behind him, and that could enable his competitive juices to kick in for a new top effort good enough to post the upset. Long Range Toddy gets the extreme outside post but that's not a concern because of the expected faster than average early pace in the race. Grey Attempt stretches out from six furlongs and has run very fast early in his previous two route races. One Flew South adds blinkers, which should cause him to show a lot of early speed, and Jersey Agenda is a need-the-lead type who has to go fast early to gain position from his 10 post. All that early pace and positioning allows Long Range Toddy to drop into a great trip possibly just a couple of paths wide going into the first turn, similar to where he was early in the Rebel, in which he rallied from fourth in the last eighth of a mile to earn a career-best 109 Figure. Prior to that, Long Range Toddy had traffic trouble with a quarter of a mile to run and still managed third. With three wins and one second place finish from his four other route races, it's obvious Long Range Toddy shows up every time with his “A” game and as such he is a strong contender in this year's Arkansas Derby. Improbable was returning from three months off in the Rebel and had his schedule re-adjusted when his home base of Santa Anita was closed temporarily. A perfect three-for-three in 2018 including a sharp win in the Los Alamitos Futurity with a 103 figure, Improbable still earned a new best 109 figure in the Rebel when coming up a neck shy of Long Range Toddy on the wire in spite of the time off. Likely to improve in his second start off the layoff, Improbable certainly can run well enough to win, but he is likely to be the betting favorite because of perceived improvement in his second start of the year and because his trainer is Bob Baffert. However, it can reasonably be assumed Long Range Toddy can take another step forward as well and potentially deny his foe another win on the wire. Omaha Beach won the second division of the Rebel last month, earning the best last race figure in the field (110), his fifth straight improvement in speed figures since his debut last summer. The Rebel was his first two-turn race on dirt and he met the challenge with flying colors as he moved up comfortable from third in the early stages to lead by two lengths in the stretch before holding off Game Winner by a nose. Game Winner returned to run in the Santa Anita Derby last weekend and was once again denied by a narrow margin by Roadster. Game Winner's speed figure regressed to 106 in the Santa Anita Derby and so although Omaha Beach may continue his pattern of improvement that is something to note. The rest of the Arkansas Derby Field, with their best Equibase Speed Figures in a similar race, is Country House (94), Grey Attempt (107), Jersey Agenda (96), Laughing Fox (99), One Flew South (89), Six Shooter (100) and Tikhvin Flew (95). This entry was posted in Horseplayers and tagged arkansas derby, Ellis Starr, equibase analysis, galilean, Handicapping, horseplayers, improbable, kentucky derby, long range toddy, omaha beach, road to the kentucky derby by Ellis Starr. Bookmark the permalink.